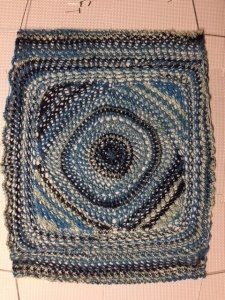 The basic circle as worked in the shawls, out to 128 stitches, then divided into four groups of 32. Each of these is worked as decreasing short rows to make a square, and then knit around, doubling to a total of 256 stitches. Then, one side is picked as top, and the opposite as bottom, and 64 stitches of each are worked back and forth to make a rectangle for the back. For the front, when dividing the work to make the four corners to shape the square, split one group of 32 into two parts and work the piece back and forth when doing the short rows to make the V-neck opening, decreasing along the neck edge every few rows to get the shape you want. Or you could work the front the same as the back for a crew neck. Either way, you will need to add a couple of inches of knitting at top and bottom to make the rectangular shape. For sleeves, knit a circle out to about 12″ diameter, 128 stitches. 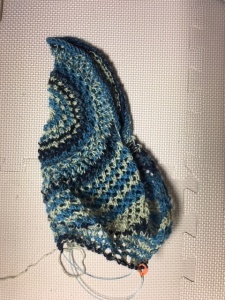 Divide the work onto two needles, and work one half (64 stitches) in pattern of choice, first using two groups of short rows to “square off” the edge, then begin knitting across all 64 stitches in pattern, decreasing one stitch each edge every 5 or 6 rows until 46 stitches remain. Then work even until sleeve is desired length to underarms. Sleeve in progress. The short rows are complete and the straight pattern starting. 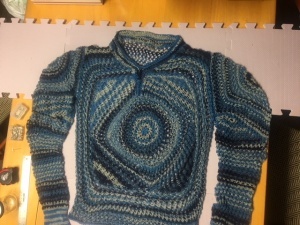 You can see how the short rows have created the triangle shaped insert which changes the angle of the work and fills in between the circle and the straight pattern of the sleeve. Knit to desired length in pattern and switch to plain stockinette stitch for a turn back cuff. When assembling the sweater, sew the front and back side seams, leaving about 9 inches sleeve opening. Then sew shoulder seams, and ease the sleeve cap into the opening and sewing the sleeve seams last. As you can see, it is a rather unusual sweater. Fun to make and fun to wear. The pattern makes it quite “stretchy”, so it likely is a one-size-fits-nearly-all pattern. And here is another quickie. Cast on 100 stitches using a multi-colored sock yarn, knit a few inches in pattern of choice, then double to 200 stitches, knit a couple more inches, double again to 400 stitches. 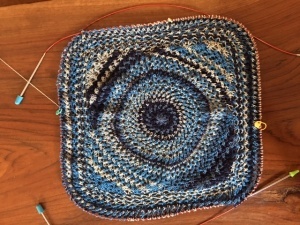 Change to a solid color yarn. I used Paton sock yarn in “linen” color and knit an inch or so. Divide the work into three parts: 100 stitches for each sleeve, and 200 stitches for the body, placing each part onto a circular needle. Knit the body even in the round until desired length from underarms, switch to a twisted knit 2 x 2 ribbing and knit a couple of inches of ribbing. Knit the arms in the round, placing a marker at the inner edge. 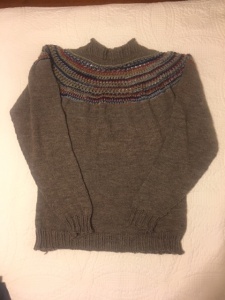 Knit in stockinette, decreasing one stitch at both ends of every 5th round ten times until 80 stitches remain, then decrease two stitches every 4th round fifteen times until 50 stitches remain. When sleeve is desired length, decrease 6 stitches evenly spaced (44 stitches) and change to twisted knit 2 x 2 ribbing for 2 inches. To complete the neck, using main solid color (linen) pick up 100 stitches around the top of the piece. Work in stockinette stitch, decreasing 2 stitches at each side every second round. After about 2 inches of stockinette, change to twisted knit 2 x 2 ribbing and knit 2 inches of ribbing, continuing the decreases at each side every row. When neck is desired diameter, bind off loosely. I think of this as a sort of “mock-fair-isle” sweater. But easier. 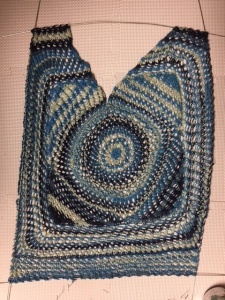 This makes a medium size and can be easily scaled up or down by adding or subtracting stitches in multiples of 10.